This book by Samuel Bowles explores the theory that incentives might backfire if they foster the very self-interest that they were designed to harness. He gives the example of a child care centre which adopted a policy of fining parents if they were late in picking up their children with the result that late pickups increased as parents felt it was morally acceptable provided they paid the fine. The rule was subsequently reversed but this group continued to be late in picking up their children compared to a control group which did not have any change in policy. Putting a price on every human activity erodes certain moral and civic goods worth caring about. Having noticed a suspicious bunching of sick call-ins on Mondays and Friday's the Boston fire Commissioner ended the fire department policy of unlimited paid sick days. Instead, he imposed a limit of 15 sick days and if fireman exceeded that limit they would have their pay docked. The number of fireman calling in sick on Christmas and New Years Day increased tenfold as a result. The Fire Commissioner retaliated by cancelling the fireman's holiday bonus cheques. The firemen were unimpressed and in the next year, they claimed 13431 sick days up from 6432 a year earlier. Many firemen apparently insulted by the new system abused it or abandon their previous ethic of serving the public even when injured or not feeling well. Why do policies and business practices that ignore the moral and generous side of human nature often fail? Should the idea of economic man-the amoral and self-interested Homo economicus-determine how we expect people to respond to monetary rewards, punishments, and other incentives? Samuel Bowles answers with a resounding "no." Policies that follow from this paradigm, he shows, may "crowd out" ethical and generous motives and thus backfire. 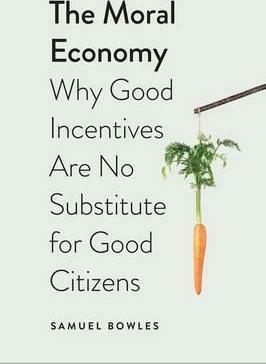 But incentives per se are not really the culprit. Bowles shows that crowding out occurs when the message conveyed by fines and rewards is that self-interest is expected, that the employer thinks the workforce is lazy, or that the citizen cannot otherwise be trusted to contribute to the public good. Using historical and recent case studies as well as behavioral experiments, Bowles shows how well-designed incentives can crowd in the civic motives on which good governance depends.